The world watched in horror as Islamist terrorists attacked the Indian city of Mumbai. The 3 days of rampage in the financial hub, killed almost 200 hundred people and injured more than 300. The dead included 22 foreign nationals. 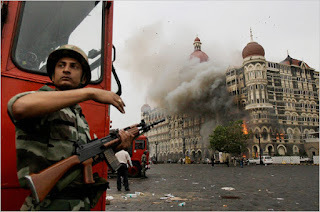 The terrorists, who are said to have arrived on boats and dinghies, attacked the historic Taj Mahal Palace Hotel, the Trident Oberoi Hotel, the Nariman Chabad House, a train station, and other targets, killing people indiscriminately. Police shot dead nine of the terrorists and arrested one. The Mumbai police chief, Hassan Gafoor told reporters that the 10 heavily armed young men were all trained by former army officers in Pakistan. The one surviving terrorist told authorities he was from Pakistan, and they had traveled by sea on a three-day journey from Karachi. As the investigation moved forward, there were questions as to whether authorities could have anticipated the attacks, especially after reports surfaced that Indian was warned just 8 days before of an impending attack from the sea. The terrorists never issued any demands, and it seemed clear, from dozens of reports on CNN-IBN, that they intended to fight to the last.